Like many dentists, Comparethetreatment’s oral health expert, Ben Atkins has helped many of us master the challenges of cleaning our teeth to ensure we keep our smiles bright and healthy. The secret of success is to cover the whole mouth, getting in between those awkward gaps between teeth and covering all five surfaces of each and every tooth. But, occasionally, we struggle with our oral health routines, may even skip the recommended two minutes twice a day because our lives are so busy – and, as a consequence, risk doing untold damage to the health of our mouths thanks largely to unintentional neglect. We may also brush too hard, causing erosion to out teeth – or not quite reach between all our teeth and so, sometimes it may be a simple case of tweaking our poor technique to make a positive difference to the long-term health of our mouth. New technology can make our lives easier in so many ways – and teeth cleaning is no exception. 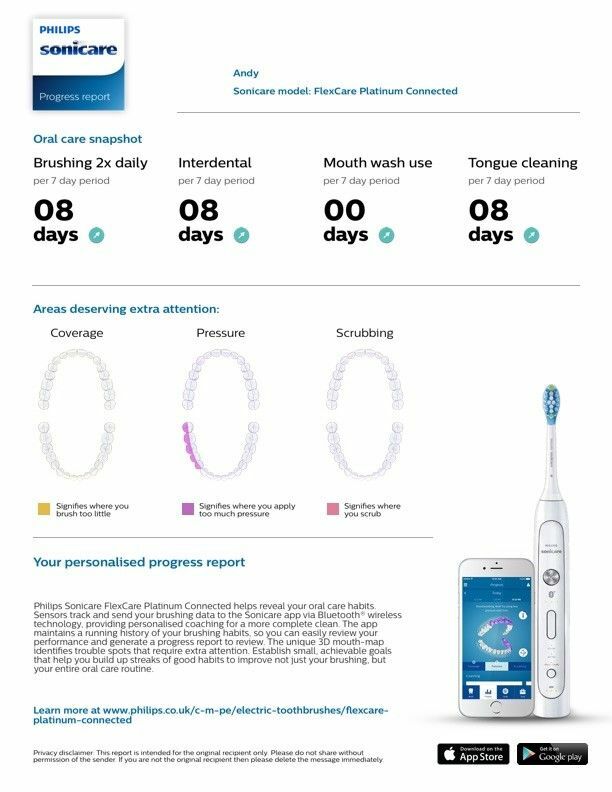 The Philips Sonicare electric toothbrush is designed to guide us to more effective brushing as if a dentist is in our bathroom! In fact, it even emails your dentist after every use with updates of your progress. Andy is a patient at Revive Dental Care and is using the Philips Sonicare on Ben’s recommendation. The app tracks how Andy is brushing, the frequency and duration. This information is emailed directly to Ben via the app in easy-to-read reports. From these, Ben is able to monitor his performance and assess his compliance with instructions. In addition, he can programme the app to focus on up to three specific areas within the mouth. So, just how easy is it to use? Ben says: ‘I love this Philips Sonicare FlexCare Platinum brush. The app is a great addition and brilliant for developing awareness and allowing patients to see where they are. I love the technology – it’s the cool side of dentistry and makes some patients really want to brush their teeth. ‘It makes a huge difference to my clinical practice and the oral health results for my patients. It’s such fun – it’s almost a novelty! And it makes teeth cleaning so much easier because the brush does all the work. There’s no risk of over scrubbing or missing areas because the brush monitors technique. ‘I’m hugely passionate about electric toothbrushes – and patients need to find the right one for them. It may appear expensive but the solution is to buy one unit for family use and then purchase different heads. We have the highest decay rate in the country where I practise in Salford and I have seen the changes the brush can make. Another patient of Ben’s even installed a phone holder on her bathroom mirror so she could more easily follow the app’s instructions while she was brushing.